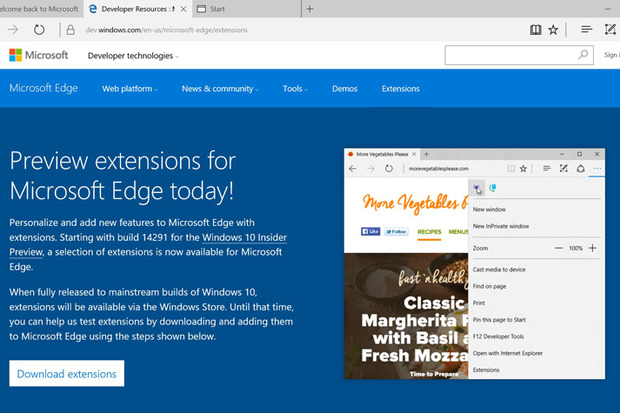 Microsoft yesterday updated its Windows 10 preview, adding support for extensions to the default Edge browser, finally fulfilling a promise it made last year that was itself a delay on a pledge to boost the browser's functionality. As part of Windows 10 build 14291 -- the latest in a series of test versions fed to participants in Microsoft's Windows Insider program -- Edge can now run one or more of the three extensions the Redmond, Wash. company currently offers. "The Windows Insider build will include three preview extensions: Microsoft Translator, an extension that automatically translates pages in over 50 different languages, a Mouse Gestures extension, and an early preview version of the popular Reddit Enhancement Suite (RES)," said Drew DeBruyne, Edge's general manager, in a post to a company blog late Thursday. "Later this year customers will find popular extensions from partners like AdBlock, Adblock Plus, Amazon, LastPass, Evernote and more." DeBruyne said Edge add-ons would "ultimately" reach the production version of Windows 10, but gave no timeline. Microsoft is expected to update 10 this year, most likely in mid-summer -- around the one-year anniversary of the OS's debut. Microsoft has essentially dead-ended IE by relegating it to legacy support. Although it has promised to support IE11 through Windows 7's January 2020 retirement, it has demanded that customers abandon most older versions of IE. The mandate caused a dramatic decline in Microsoft's share of the browser market. Under Microsoft's original plan, add-ons were to make it into Edge last year, but five months ago the company acknowledged it would not make that deadline. The lack of add-ons has been a sticking point with users, many of whom have cited the omission as the reason why they set Edge aside and went with another browser, primarily Chrome. Edge has not succeeded in holding a majority of Windows 10 users, according to several metrics sources. Depending on the data, Edge accounted for between 13% and 31% of the browsers run by Windows 10 users in February. U.S. users have been more likely to run Edge than the global average. Currently, Edge users download add-ons directly from Microsoft, but when the browser is included with the next Windows 10 production build, extensions will be available from the Windows Store, analogous to Google's practice of limiting add-on distribution to the Chrome Web Store. Build 14291 and the preliminary Edge add-ons are available only to Insiders who have selected the "Fast" release track.